They are off and the adventure has begun!!! The team has been gone a week already, and I keep telling them to blog and let us know what is going on. I have not set a good example because I have yet to blog since they left. I am going to change that now. Months of planning, praying, phone calls, meetings, and all that goes into setting up a trip like this have brought us to here. On Monday Sep 14th we took Lukus, Bethany, Vanessa ,and Star to the airport to begin the adventure. After moving things from bag to bag so as not to be overweight and have to pay, the team went through the security and on to their gate. At that point you realize, they are now on their own. Of course, they landed in Miami in time to make their connecting flight, only to sit in the plane for almost an hour. When they finally let them off the plane they had just a few minutes to go to the other side of the airport to catch the next flight. They would have missed it, but they had "mechanical problems". Not too comforting when you hear that, and they have a four-and-a-half hour flight to go. They made it fine about 10:30 that night to Guayaquil Ecuador. The next day they caught their next flight to Cuenca Ecuador, their home for the next month. The week they have been there has been a time of adjusting to another culture, and language. They are staying in the homes of people from the church that they are working with. The team has been learning their way around the city, and building relationships with the people at the church, school, T V station, and homes they are in. Please pray for them as they learn to relate to people in a different culture, and way of life. God has great things in store for them, pray that they will be open to His leading. Any encouraging words you have for the team, i am sure would be appreciated . You can comment on their blogs. Thanks. Hebrews 11: 1 says: Faith is the substance of things hoped for, the evidence of things not seen. The "Message" states it like this: The fundamental fact of existence is that this trust in God, this faith, is the firm foundation under everything that makes life worth living. It's our handle on what we can't see . As Christians we wrestle with this faith thing, because we have heard so many different views on faith. One says: if you have enough faith you should have the best of everything because you are the child of a king, another says: if you have enough faith you will never be sick, another says: if you are having problems it's because you don't have enough faith, and the list goes on and on. I don't think God meant for it to be so confusing and complicated. He says we are to approach him in a simple child-like manner. Children accept things at face value. They believe what was said, and don't over-analize and try to figure out what was "really" meant. As God's children, we need to realize that the faith we have should be like a child's, and when God speaks to us , he wants us to accept it at face value. When God speaks, what he says, usually seems imposible, crazy, or just doesn't make sense. When God speaks, it also seems like our response requires a step of "faith". Sometimes it is a small step, but , more often it is a huuuge step out of our comfort zone. As we step out and do what God asks of us we have to rely totally on Him. What a concept!!!!!! Isn't that what God wants? When I look back at the times I had no idea what I was doing, and had to rely on God: those are the times He was able to use me the most. Several years ago I felt like I needed to go to London for a few days( sounds crazy, right). I didn't have the time or money. God put a special love for London in my heart, so wanting to go there was not so weird to me, but I really had no reason to go. I had been praying for London for quite a while, and did not know anyone there that was a Christian. The only thing I knew was that London needed God and to all appearances it was a godless city. I put the thought out of mind and went-on with life. From time to time I kept feeling I needed to go. Several weeks later a friend asked me to oversee a small remodeling job at a university, where I was doing another job. The building I had under construction was large and complicated, taking up most of my time. I told him I probably didn't have time to oversee another job. His answer was: just look-in time to time and make sure we aren't doing anything wrong, or creating problems we don't know about. Then he said, I will pay your's and Voni's way to London if you do this. I took him up on his offer, and about a month later I was in London. For some reason I went over alone a few days before Voni, and she came over later. On my first day there, I felt like I should call my nephew in Amsterdam (He was a missionary there at the time). After talking to him I felt like I needed to go see them, so I found a cheap ticket leaving in a couple of hours and went to Amsterdam. The next day was Sunday, so I went to church with them. After church, my nephew introduced me to a young man from San Luis Potosi' Mexico, where I grew-up. This young man was studying english (go figure) at a university in Amsterdam. He had just accepted Jesus in his heart a couple of weeks before. His classes were going to be finished about two weeks later and he would be going back to Mexico. When we talked he told me how excited he was to be a Christian, but , he didn't think there would be any christians back home. San Luis Potosi' is a city of about a million and a half people. I was able to tell him of several churches in his home town where he could find other Christians . Then I found out a very good Christian friend of mine was the president of the university he went to back home, and was able to get them connected. Does God really care enough about his children to have someone travel from the U. S. to Holland to let him know there are brothers and sisters in Christ in his hometown in Mexico? I think he does. When I went back to London, I had been given the name of a man and his wife, who pastored a church in London somewhere. I had a day and a half before Voni came, so I decided to find them. I looked in the phone book: no luck. I didn't know the name of the church, so no luck there either. I walked all over central London looking for a church or, someone who knew Mike and Jacky, no luck. When I met Voni at the airport, she said that my sister (who is a missionary in Hungary) had called and had been to these pastor's home several years before. All she could remember was that they lived in a building across from a theater side entrance marked STAGE ENTRANCE with a sign. Now remember this is London we are talking about,but, as soon as I heard that I knew right where it was. Coincidence ? I don't think so. Voni and I went straight there once she was settled in our hotel. When we arrived at the building, it was several stories tall and only had buzzers for each apartment. None of the buzzers had names, we didn't know what to do. While standing there trying to figure out what to do, a man walked up and asked if he could help us. We told him who we were looking for and he knew them and confirmed we were at the right building. He also knew what apartment they lived in. Then I had to try and explain why we were looking for them and why we were there, over the intercom (great fun). We didn't even know why we were there. After meeting Mike and Jacky they told us that in two days all the churches of central London were going to have a joint prayer meeting to pray for the city. As far as anyone knew it was the first such meeting. We then knew why we were there. The prayer meeting was awesome, but, the way God brought it all together was even more amazing. The reason I tell this story is that the whole God-orchestrated trip didn't make sense in the natural, but , God knew the timing , devine appointments and what He wanted to accomplish through all of us. Even more astounding to me is the fact that God cares enough about us to bring together a plan involving people from four different countries just to show us that He is concerned with every area of our lives. The things that he did for us on that trip were not life-or-death and yet He Cared. How much more does He care about the real needs and problems in our life. We need to listen to God and trust him enough to do what He says to do. He is not the author of confusion, so don't listen to the devil when he says "that is you, not God', or "that is the devil". Ask yourself: would I come-up with this on my own? or , is this a God thought? On Sunday my pastor said, "there is a spoiling power in the earth and if left unatended your faith will deteriorate". Lets not leave our faith unatended. Lets learn to listen to God and by faith go and do his will. So, what is faith? I think it is what allows us to see situations through God's eyes and not ours, and react to them His way not ours. Trusting God sounds like such an easy thing to do. We all know that God is all powerfull, all knowing,and has our best interests at heart. OR DO WE ? Because I was raised on the Mission field and have been involved in missions my whole life: "trusting God", "living by faith", "dying to self", Etc. are all phrases that are very familiar to me. Also very familiar to me are all the reasons people who" really really" wanted to go on a missions trip, but, when the time comes they can't. So many times we have seen people robbed of dreams or visions they feel God gave them, because at some point they had to turn all control over to God and trust Him. How many times have I missed out on God's best because I couldn't Trust Him ? If you have been involved in planning an outreach, or mission trip you are also aware of all these things that come up when someone wants to do something special for God. When talking to someone who has never been on a missions trip, but wants to go, I always tell them to expect a very good reason to come up that will make them question if they really should go or not. I have seen God supply supernaturally in order for people to be able to go. I have seen God change countless lives because they trusted Him and stepped out of their "comfort zone" and obeyed Him. I have seen God perform miracles through "ordinary" people. The common thread is: they all did something that they knew they couldn't do on their own. They HAD to Trust God. Yet Istill find myself thinking Did God really mean that? Or is he going to come through in time? When you spend your life telling people to get involved in missions as I do, You are always encouraging them to "Trust God". For some it is the finances that they need. For others it is the fear of another culture, or language. For others it is a fear of traveling around the world, or on a plane. The first trip is always the hardest one. Up until the trip I find myself worrying for them. Why do I do this? God has ALWAYS come through. Now I find myself convinced that God wants to use this generation of young people to change the world. The tool that he has placed in our hands is the "Culture Shock" trip. I know that it will change lives, ministries, and countries. Because it is such a long trip it of course is not cheap, so I am here again telling them God can do it if you Trust Him. New Website For Culture Shock!!! I think we finally have the new website for "Culture Shock" finished, and live. Now we will be working on getting each participant a blog page. We are expecting great things of this feature. I know that it will be a wonderfull tool to keep everyone informed on the progress of the trip, but, I believe it will be a source of great blessing for eveyone involved in sending these young people to the mission field. God is doing awesome things around the world, and he will do the same in and through their lives in the months ahead. 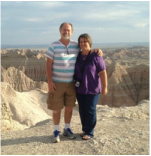 Click Here to learn more about Rodney and Voni Johnston! Learn more about Network 21 Missions!